The purpose of suitability assessment is to provide additional information on the person considered for a particular job. Suitability assessment provides information that can not be achieved by other methods alone (interviews, training or work experience). The Finnish Psychological Association defines assessment process by an expert as a planned and systematic assessment process aimed at assessing, evaluating and predicting an applicant's features and likely activities in a future job assignment. More and more, many IT and technology tools play an important role in this assessment work by providing software solutions for the processes (gathering, analyzing and automating data processes). The interpretation of results thus gained still remains a responsibility for an expert. The overall problem and challenge for any evaluation is how well the task definition (and before that, the task analysis) is conducted, and on the other hand, how to evaluate the suitability of the person for that task (suitability assessment). In order to be of any use an appropriate assessment process should increase the probability that the defined tasks and the qualities of the assessed person meet to a significant degree. Suitability assessment is an approach among other information gathering processes increasing the likelihood of savvy hiring decisions, and should be seen as part of the whole consisting of several different methods and measures. It produces a forecast and a recommendation, improving the above mentioned likelihood by providing new perspectives. Suitability estimates can often help maximize benefits and minimize risks. Unsuccessful or even detrimental hiring decisions are believed to accrue high costs of different kinds for an organization, many of these costs being immediate (pay and staff costs) and some having indirect effects (lost work, lost income, job recruitment costs). High quality methods that have been developed scientifically yield results that correlate with success in work. Pragmatically considered, predictions gained using valid forecasts are even in the worst cases always better than merely going by guesswork. The practical aim of a hiring organization will usually be to effectively combine different evaluation methods with the lowest possible resource costs. To achieve the best possible outcome, a number of suitability assessments should be included in the assessment of applicants. The extent to which the overall accuracy of a global assessment process is improved by various methods depends on many factors. Especially in evaluations where people assessed do not have relevant work experience or training, psychologial assessments obviously play a very important role. As a general rule of thumb, the more various methods are used, the better the outcome achieved. An individual assessment method should preferably be interpreted in a context of a combination of various methods and perspectives. The likelihood of reaching savvy decisions based on valid suitability assessment procedures will be improved by utilizing several evaluation methods! However, the use of multiple assessment methods often requires additional work and costs. 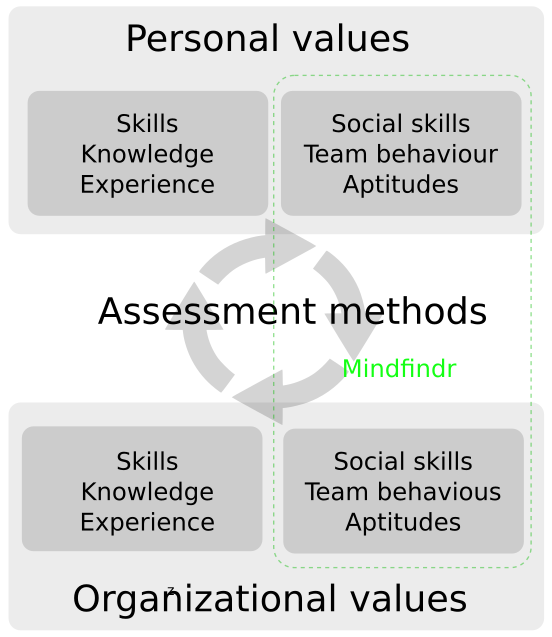 In the Mindfindr solution, even leaving aside the fact that the service combines different assessment perspectives discussed more deeply elsewhere, the added value is specifically justified by the above factors: Mindfindr suitability assessment procedures can be implemented easily with minimal marginal work, not to mention trivial marginal costs per an extra assessed person (the capacity allows taking up to several thousands of tests at a time). The cost of one suitability assessment is very low in relation to the benefits achieved. The benefits are duplicated in relation to the number of evaluations. Recruiting always takes place with limited information. All cost-effective and risk-minimizing information should be channeled to support decision-making.